Purpose: Use this document as a reference for what to enter for the dates on the Retirement Plans in ctcLink and what is their significance in the downstream data flow to DRS. This is to be followed while hiring or while changing the Retirement plans. There are 2 pages where Benefit Admins make entries while enrolling employees in a retirement plan. The dates entered on these pages then flow down to DRS Transactions and Transmittals as the Begin Date. It is important that these dates are entered appropriately so as to avoid any data discrepancies in the reporting to DRS. 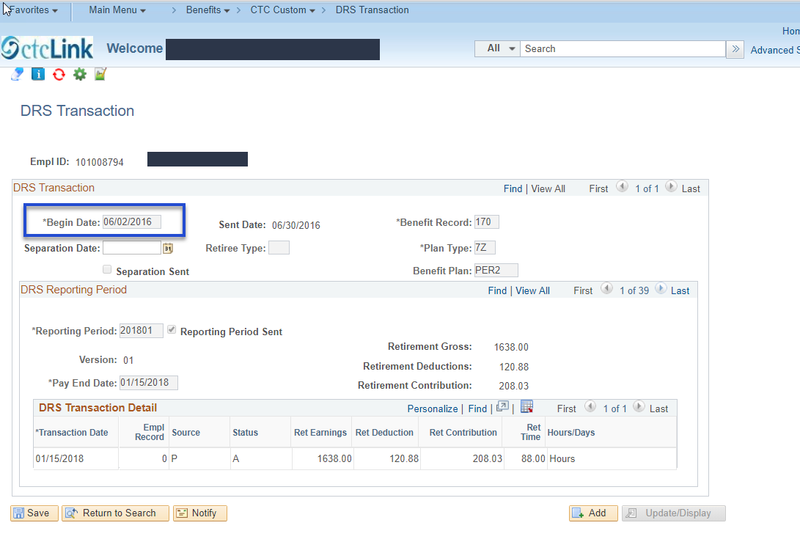 The Begin Date on the DRS Transaction Page is the Election Date selected on this Retirement Benefits Page. While an Election Date can be earlier than a Deduction Begin Date, it must never be later on an Elect action to avoid such issues. Effdt = Election Date & Retirement Plan Effective Date = Deduction Begin Date. DRS Option Date : The date an employee signs a Member Information Form indicating the beginning of the 30-day period that the employee has for deciding between PERS or TRS Plan 2 or PES or TRS Plan 3.